Ellie is using Smore newsletters to spread the word online. Alan was born on 23rd June 1912 In London. His parents where in India at the time until his Father retired from the Indian Civil service in 1926. 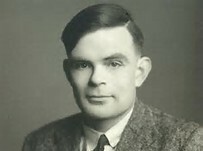 Whilst his parents were away, Turing stayed with family and friends. He worked as a computer scientist and was among the people who created the first computer. Turing first came up with the concept of AI (Artificial Intelligence) which was present in the 'Turing Machine', an imaginary machine. Alan came up with the initial idea that computers can do what people cannot. How did Turing Change Tech? Alan helped move on technology by creating the first ever computer. Without this amazing feat the world wouldn't be as it is today. Many modern gadgets would never have existed and small daily tasks we take for granted may have not been pursued in the same way. Cars wouldn't have advanced as far as they heavily rely on computers today. Alan worked on the German Ciphers (secret messaging) using cryptanalysis to decode them. Using cryptanalysis he helped to break the codes of the Enigma machine. After that, he solved other German codes.